The City of Tucumcari and The Quay County Office of Emergency Management will be testing the emergency warning sirens in Tucumcari, New Mexico every Wednesday at 12:01PM. This is only a test. In the event of inclement weather, the test will be canceled. 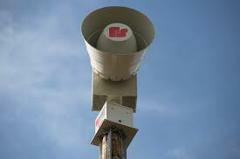 In the event of an actual emergency activation of the warning sirens seek shelter and more information.